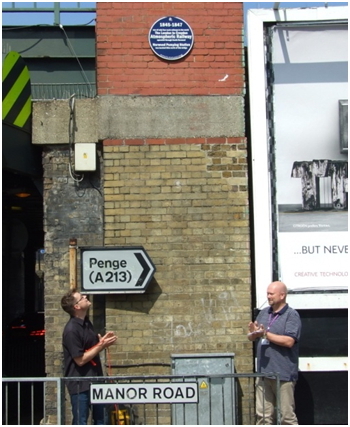 This plaque, on the Portland Road railway bridge in Manor Rd, marks the site of the Jolly Sailor pumping station for the London and Croydon Atmospheric Railway. This unusual technology uses differential air pressure to provide power to propel a railway vehicle. A static power source can transmit power to the vehicle in this way, avoiding the necessity of carrying mobile power generating equipment. The air pressure or partial vacuum (i.e. negative relative pressure) can be conveyed to the vehicle in a continuous pipe, where the vehicle carries a piston running in the tube. Some form of re-sealable slot is required to enable the piston to be attached to the vehicle (this was the case in Croydon). Alternatively, the entire vehicle may act as the piston in a large tube. Several variants of the principle were proposed in the early 19th century, and a number of practical forms were implemented, but all were overcome with unforeseen disadvantages and eventually discontinued. 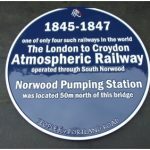 Croydon’s railway was one of only four such railways in the world. The sealing for the slot was made of leather, which tended to perish, and there were problems with the pumping system. A modern proprietary system has been developed and is in use for short-distance applications. Between 1839 and 1847, however, the Croydon pneumatic railway flourished, regularly carrying a large number of passengers. One part of the infrastructure was the viaduct from Sydenham to Crystal Palace, crossing the main lines. The pneumatic pipe could not cross the metal rails, so it was necessary to build a fly-over. This is reputed to be the first of its kind and is still in use today. Jolly-sailor station on the London and Croydon Railway in 1845, showing the pumping station, and the locomotive-less train. See also Tom Brown’s book Strange Air, about this type of railway.